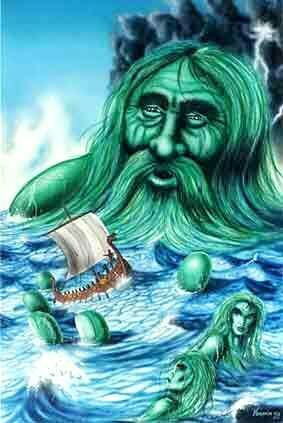 Aegir means "sea", He is the presiding spirit of the ocean,and is understood to actually be the ocean. Aegir is an ancient God who is sometimes called a Jotun (Giant). Aegir is on very good terms with the other Norse God/desses, and socializes with them in Their halls and realms. Aegir is known to be a wonderful generous host whose invitations to his deep sea parties are deeply coveted by God/desses and Shaman. Aegir's realm beneath the sea is also a place of the dead. Those who die at sea or whose bodies are put in the ocean are believed to journey to his realm. As an afterlife realm, Aegir's is very pleasant - there's usually a party going on with lots of food and drink. Apparently Aegir brews the best mead and ale in the whole world! Though Aegir is loved, He is also feared. He offers protection to seafarers, but he also can raise storms that can cause shipwrecks. Saxon pirates would throw prisoners overboard to appease Aegir and guarantee smooth sailing. Aegir sometimes mariners see Aegir standing on the surface of the water, far out to sea. He may be offering protection or He may foretell the beginning of a violent storm. Petition Aegir for safety on the sea and to reveal the secrets of the deep. Aegir is a well of knowledge and can fulfill any request or recruit another God/dess who can. FAVORED PEOPLE: Aegir is the patron of brewers. MANIFESTATION: A large vigorous man with a long, flowing mane from which water flows He's proud of His beard and adorns it with charms, seashells, sea plants, and beads. ATTRIBUTE: A gigantic cauldron in which He brews mead and ale. CONSORT: Ran (who is His sister). They have nine daughters called the Nine Wave Sisters. SACRED TERRITORY: All seven seas, but also Laeso Island near Denmark, famed in the middle ages for it's salt industry. OFFERINGS: What ever offering you give to Aegir, be generous! Give Him fine old coins (sailors once carried them in case they drowned, so that they wouldn't arrive in Aegir's realm empty handed). Serve Him mead and ale, but be sure to acknowledge that it isn't nearly as fine as the mead and ale that He has at home. Offerings may be given at an Altar or brought to the sea.